In Bartow and in the US you start playing football as a small kid. The youngest of them are 7 years old. 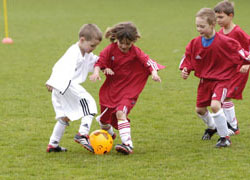 Until the tenth years the kids generate a lot of sportsmanship, and only the willing ones continue playing football. Your career continues in Football Clubs at Junior High School, Middle School and High School. Henceforth the seriousness of Football raises. Many people watch High School Football already, and you are able to get a scholarship to go on to a college. If you are good enough, you can join a college football team, which is a great step in your career, because college football is even more famous than the NFL, which you join after your college graduation. Your career end depends on your position (oldest active professional football player in the NFL was 47). In Germany you start playing soccer as a small kid. There are even children teams for 4 years old. Because you are not bound to a certain school with its team, you are able to change your club, so you can find a club, which is on your skill level. Until your 16th year, you improve your skills in different clubs. You are able to go professional if you are 16, if you are good enough. If you are not that good, you can still play in several inferior soccer leagues. There are no clubs of colleges or universities. The most important difference is that soccer and sports in the main are not bound to the education system or to a certain school, so you can join any club you want in your town. Your career ends at the very latest at 40 years. Promotion is not a big deal in football in the US during your school career. You get only promoted in your football club. After your high school graduation you can get a scholarship for college. The American Youth Football Association does not pursue a concept for talent promotion, but profess the league structure. The german soccer promotion system is more expanded. German talents are promoted even by the education system, in the form of ‘Elite Schools of Soccer’ like the Maerkische Schule in Bochum, to be sure, that you get a good graduation as provision of an abrupt end of your soccer career. and by the German Soccer Association DFB, which focus on the promotion of young talents. Why is American football the most famous sport in The United States? There are many opinions why American football is the most important and popular sport in the United States. First when football (Soccer) was migrated to the USA in the 1800s, a lot of the country was still wild and lawless. It was more a violent state because the government was very weak and the police force was not strong. So the people did not obey the rules. Most of the population and the citizens liked to start playing this sport because of the fact that they could be very aggressive and could do what they want. And today the sport is really aggressive. Body weight is a big factor why American football is specifically popular in America as its caters for people who are overweight, the stop start nature of the game allows people to rest constantly. American football is also a contact sport and the people like to see the competition. In addition to these facts one can also say that American football unites people from different race, creeds and backgrounds, to join together to support a cause that gives people hope, namely to unite every race and people. Furthermore American football offers a big entertainment with an orchestra, cheerleading etc. So many people like the entertainment and this is a cause why the people watch and like football. With reference to the USA all in all one can say that American Football is more important because there are more fans who visit the Football Games than Soccer Games. But Americans do not only like to watch football there are also many people who like to play football. Mostly every American, who plays football was introduced by his father or older brother. Football is for a lot of people the most important things in their lives even when they don’t want to become a professional player. We asked a few people at the Bartow High about football, one of them was Matt. Matt is 18 Years old he is Receiver Kicker and also Panner in the Yellow-Jackets Football team at Bartow High school. He was introduced by his Father and plays football since he’s a little boy. Even when he does not want to become a professional player, football is very important to him. He trains hard every day for his Sport. Matt loves everything about football but mostly the team-spirit the environment and to feel united with his team and all the fans.